I met Kevin McAuslan one Thursday evening at Mill Creek Pub in Orangeville to talk about fungi. Two hours later, my head swirled with tales of morels, mycelia, Ötzi the Iceman and something called mycoremediation. My talk with Kevin was fruitful. I learned about fungi, but I also came away with mushroom booty. As we chatted, he would periodically reach under the table and grace me with a jar of dried mushrooms. When a thermos appeared, I was intrigued. It contained chaga tea, the steeped essence of the chaga mushroom which grows on birch trees. “The most powerful antioxidant yet discovered,” Kevin insists. I sipped tentatively. Rather bland, I thought, but not unpleasant, especially when chased by a swig of Cracked Canoe beer. 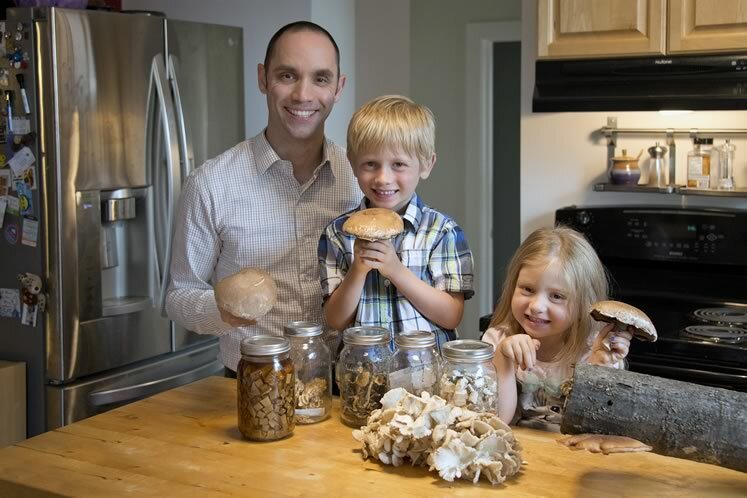 Kevin McAuslan in his Orangeville kitchen with Tenzin, 6, Violet, 4, and a bounty of mushrooms. Along with the portobellos (Agaricus bisporus) they’re holding and the pile of oyster mushrooms (Pleurotus ostreatus), in the jars of dried fungi (left to right) are a tincture of birch polypore (Fomitopsis betulina), coral fungi from Hockley (Hericium coralloides), honey mushroom (Armillaria mellea), flowery blewit (Lepista irina) from Alton, and cubes of more birch polypore. On the oak log is a shiitake mushroom (Lentinula edodes) Kevin grew in his garden. Photo by Pete Paterson. 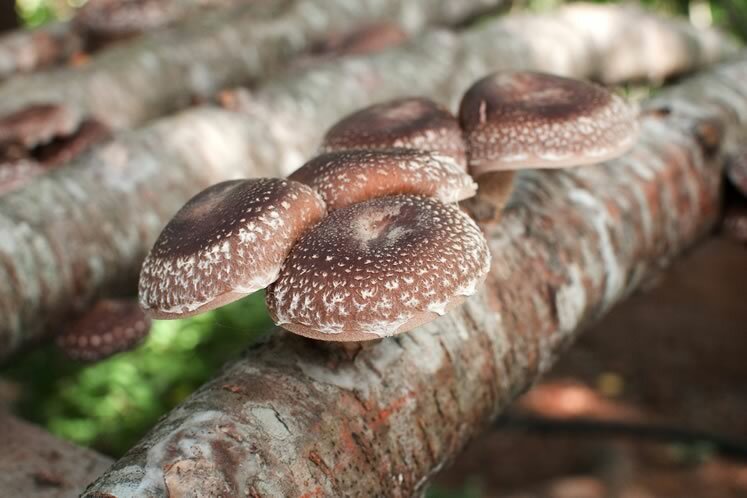 Kevin took his first tentative step beyond the world of supermarket mushrooms when he purchased a log inoculated with shiitake mycelia. The mycelium (mycelia is the plural form) is the main fungal body, largely hidden from view in soil or wood. It forms a network of filaments that, given the right conditions, produce the fruiting bodies we call mushrooms. Kevin harvested shiitake mushrooms from that log for seven years. 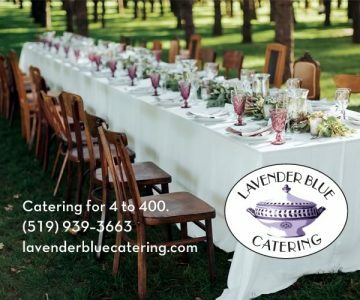 They were a gustatory revelation – and much more. His interest in mushrooms began to stretch in every direction, like fungal mycelia branching out in soil. Fungi are all around us, and they exert great influence on the life of this planet. Some, it must be acknowledged, are truly bad actors. Cryphonectria parasitica, aka chestnut blight, killed an estimated 4 billion American chestnut trees last century in the eastern United States and southern Ontario. The economic loss of these valuable hardwoods was inestimable. Forest ecology recoiled too. Birds and mammals were denied the nutritious chestnuts. Elm trees, as most Headwaters residents know, also fell victim to an imported fungus spread by bark beetles. Fungi also target animals, of course. Think athlete’s foot, or far more concerning, white-nose syndrome, the fungus responsible for killing millions of bats throughout eastern North America. Then there is the tongue-twisting chytridiomycosis (mycosis means disease caused by a fungus) caused by the chytrid fungus that is exterminating frog species in various parts of the world. This dangerous mushroom usually has a structure called a “ring” around its stem, but probably the best identifying feature is something called a “volva,” a cup-like structure at the base of the stem. This volva signals danger, but be aware it can be hidden out of sight just below the soil. Use a good reference guide to learn the combination of features that define this mushroom. So some fungi are definitely among the most harmful of all Earth’s organisms. But mushrooms and fungi are so much more. 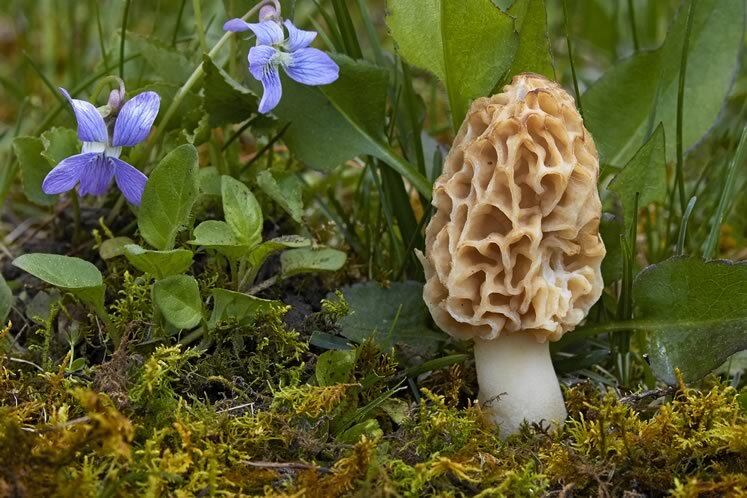 For starters, many wild mushrooms are delicious edibles. And beyond edibility, some fungi are among the most beneficial of life forms, poised to lend their unique compounds to new medicines and help us neutralize toxic waste. I’ll start with their menu-enhancing potential. As food, fungi are gaining more respect, offering protein and a range of nutrients with little caloric baggage. Many species in these hills are worth seeking out – and these species greatly outnumber the toxic ones. Kevin advises any aspiring foragers to do their homework. And this homework is easier than ever with the plethora of authoritative identification guides available in print and online. Joining a group like the Mycological Society of Toronto, and participating in some of their regular mushroom forays, would also be a great way to hone identification skills. As an added caution, Kevin suggests never eating any mushrooms raw – even those you have identified with certainty and know to be edible. This caution, according to Kevin, should extend to store-bought mushrooms as well. And another important caveat: Not everyone reacts the same way to a given species of mushroom. A few people may have an adverse reaction to any mushroom, or any food for that matter. The takeaway, according to Kevin? When trying a new species, sample a small amount first. With Kevin’s sensible cautions in mind, I’ve sought out and consumed wild mushrooms. Not many, mind you, as my mushroom ID skills still need a lot of work. 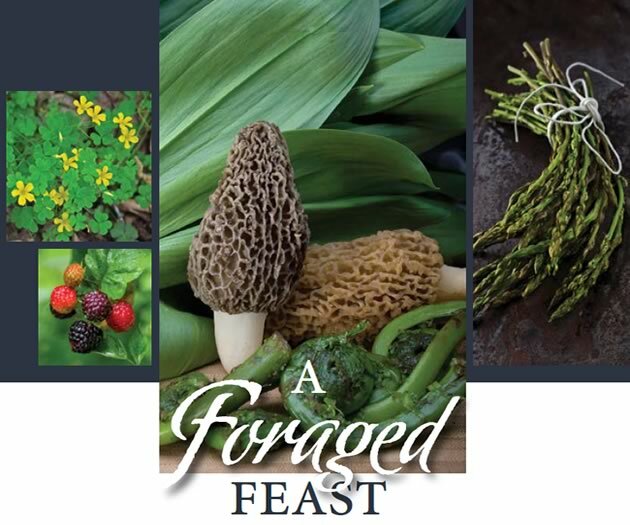 I can recognize a few distinctive species though, including morels, perhaps the most sought-after wild mushrooms. Of course, knowing a particular species of mushroom is a bona fide edible doesn’t help anyone find it. This past May, I went out with the Mycological Society of Toronto to Hockley Valley to look for morels. At roll call after two hours of searching, the group tally was 41 mushrooms. My take? Zero. Kevin doesn’t consider himself a seasoned mushroom forager. With three young children, it’s hard for him to concentrate on a mushroom quest. 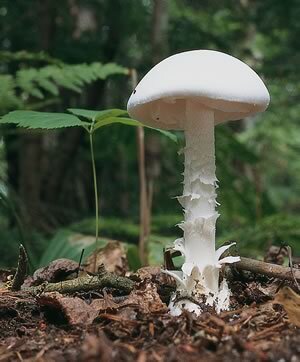 His oldest child, though, is now six years old and has learned to identify Lepista irina, a choice mushroom sometimes called flowery blewit because of the floral scent it gives off when picked. Last year, Tenzin helped his dad collect them near the Alton Mill. 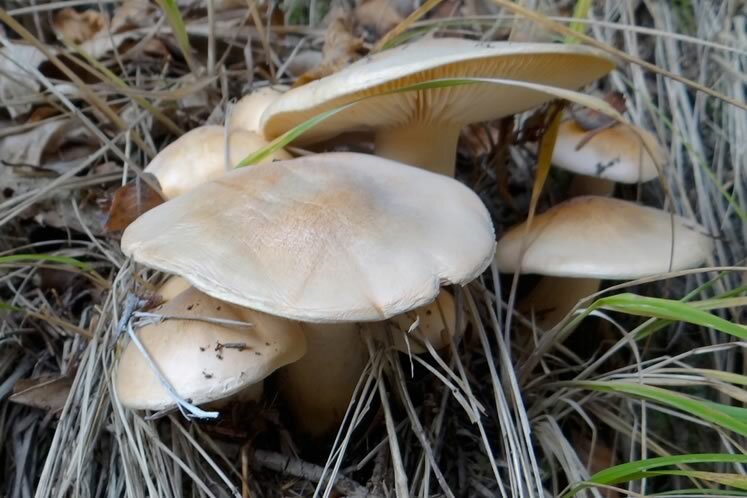 These white mushrooms with bell-shaped caps emerge in late fall and stay pristine a long time in the season’s cool temperatures and absence of fungi-chomping bugs. Kevin loves their taste. Kevin placed a jar of Lepista on the table. I received it gratefully, visions of hyper mushroom-flavoured pizza dancing in my head. Though even Kevin’s young son can now recognize Lepista, be careful. In pictures, Lepista irina looks to me just like any number of other white mushrooms. If you decide to look for them, as I will this fall, be certain you know what makes a Lepista a Lepista. Many mushroom foragers are loath to divulge their foraging hotspots, but Kevin freely shares his. Why Alton for Lepista irina? Kevin suggests the presence of lots of pine trees may be a key. Flowery blewit ~ Lepista irina. © Jerzy Opiola, Wikimedia Commons. 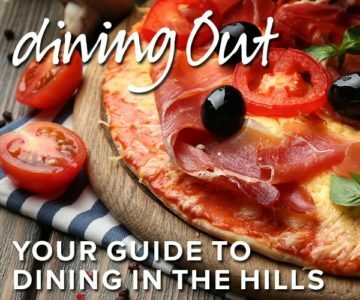 When time allows, Kevin also looks for edible mushrooms in Hockley Valley. There he visits a particular log that, year after year, sprouts a fungus called Hericium coralloides. A jar of this mushroom appeared on the table as well. The species name coralloides was apt. The mushrooms inside the jar looked for all the world like pieces of coral misplaced from a tropical reef. Though Kevin doesn’t get to forage frequently, he does continue to cultivate mushrooms, including shiitake, his “gateway” fungus. And up from under the barroom table came yet another jar packed with this choice edible. A few days after our meeting, I rehydrated them in chardonnay and water, and sautéed them in butter. Now it may be that Kevin primed me with his effusive praise of his homegrown shiitake, but honestly, they were among the tastiest mushrooms I’ve ever eaten. Their firm, meaty texture was delightful. Kevin buys dowel pieces inoculated with shiitake mycelia from a company in Wisconsin. He then hammers the dowels into holes drilled in a radial pattern around the host log and caps them with beeswax. A periodic immersion in Mill Creek, behind Kevin’s home, keeps them suitably moist. This past spring Kevin helped inoculate a hundred oak logs in a friend’s woodlot in Caledon. In a year or two, he and his friend should be up to their knees in shiitake. In his Orangeville yard Kevin also cultivates a mushroom called Stropharia rugosoannulata. The scientific name is hardly descriptive, but the common names – “garden giant” and, my favourite, “Godzilla mushroom” – suggest this is a fungus of impressive dimensions. And indeed it is, with caps that can be the size of dinner plates. As with shiitake, Kevin acquires mail order garden giant mycelia, or spawn, which he mixes with wood chips, preferably from hardwoods. He then alternates layers of these mycelium-inoculated wood chips with layers of cardboard sheets, lasagna-like, in a sunny part of the garden and stands back. Having explained this cultivation method, Kevin encouraged me to try it and added garden giant mushroom spawn to my growing mushroom loot bag. That mushrooms offer culinary gifts to foodies is hardly a revelation, but fungi also offer much more. 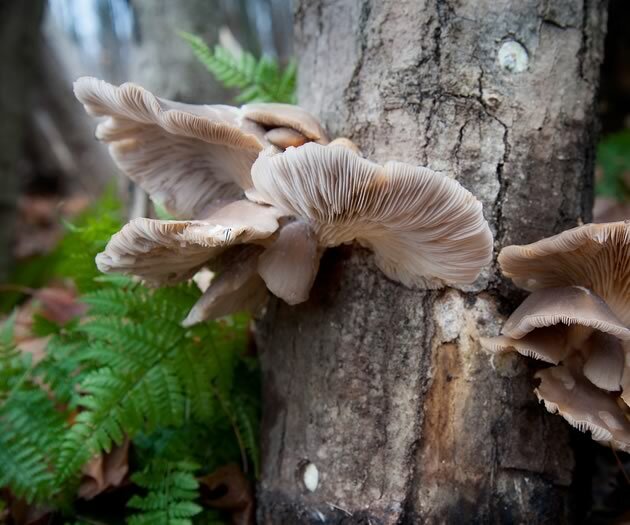 In recent decades, for example, scientists have discovered that fungi benefit forest ecosystems in essential and remarkable ways. The mushrooms seen on a walk through the woods are, as mentioned, merely the fruit of the threadlike mycelia that grow underground or within wood. In woodlands, there can be several kilometres of mycelia in every cubic inch of soil. These mycelia connect to the roots of trees, multiplying the ability of the roots to access essential minerals. And the trees reciprocate. To the fungi they send sugars they’ve processed through photosynthesis. The relationship is marvellously symbiotic. But the story of the mycelium networks becomes even more wonderfully complex. In a 1997 issue of Nature, Suzanne Simard of the University of British Columbia published a seminal work that cleverly coined the phrase “wood-wide web” to describe the mycelium-tree root networks that exist underfoot in our forests. Incredibly, Simard found these connections serve to exchange nutrients not only between fungi and their host trees, but also between trees themselves. Simard discovered in British Columbia forests two unrelated species of trees, Douglas fir and white birch, were actually helping each other via their entwined mycelium networks. Simard was “staggered” to find birch trees deliver photosynthetic carbon to Douglas firs that are unable to produce enough of their own because they are growing in shade. But as in any healthy relationship, the benefits are mutual. When the leafless birch trees are unable to photosynthesize in spring and autumn, the Douglas firs send them a carbon boost through their shared fungal network. We’re really just beginning to understand how very important these fungal networks are to our trees and forests. 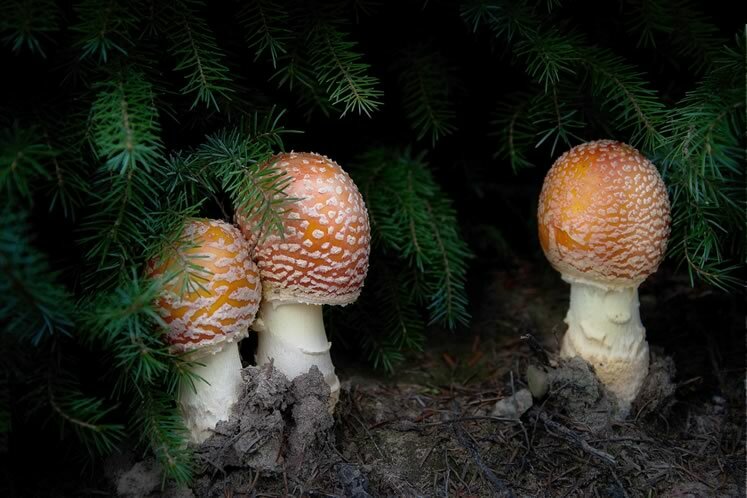 Some other fascinating revelations: Douglas fir “mother” trees – huge hub trees in the West Coast forest – can preferentially nurture their own seedlings through this fungal web. And trees can use the wood-wide web to warn each other of insect attacks. 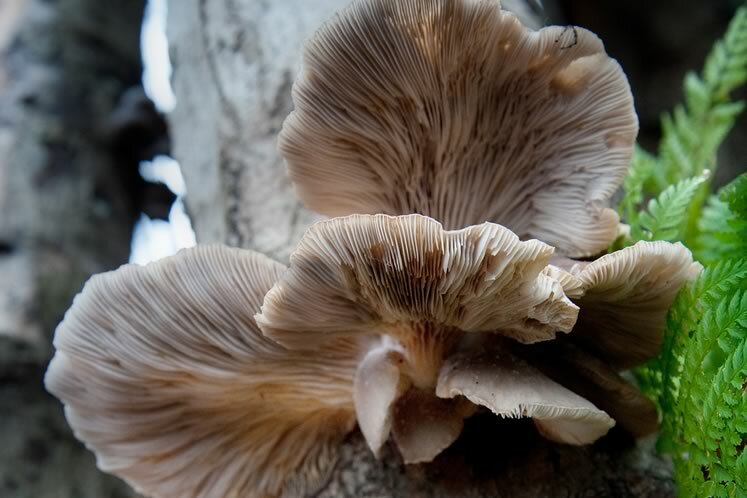 While fungi support the health of our forests, they also appear to have great potential to improve the health of damaged environments through mycoremediation. One way fungi do this is by giving plants the tools necessary to grow in toxic environments. Last October, Susan Kaminskyj of the University of Saskatoon spoke to Bob McDonald, host of CBC Radio’s Quirks & Quarks. Her team had found a few healthy dandelions thriving on the tailings of the Alberta oil sands. Back in the lab, the team isolated a fungus that grew in the tissues of the dandelions and enabled them to thrive in toxic soil. Moreover, the team discovered the fungus wasn’t specific to dandelions but could be introduced to many other plants. Tomatoes inoculated with the fungus also grew well on soil that replicated the hydrocarbon-laced tailings of the oil sands. And remarkably the tomatoes flourished in the almost complete absence of the three key plant nutrients: nitrogen, potassium and phosphorus. The fungi-inoculated plants also purified the hydrocarbons twice as fast as plants without the fungi. The implications for habitat restoration appear significant, if the lab results can be scaled up for use in the oil sands and other contaminated sites. Fungi don’t have to be coupled with plants to help clean and restore habitats. They can do it on their own. In a 2008 TED Talk called “6 Ways Mushrooms Can Save the World,” mycologist and author Paul Stamets touts the ability of fungi to deconstruct the chemical bonds of bacteria and toxins. Stamets fills burlap bags with organic waste mixed with spores from common mushroom species including birch polypore and oyster mushroom, another edible fungus found in Headwaters and beyond. Stamets calls his burlap, fungi-laced sacks “bunker spawn” and promotes their use to intercept and treat chemical toxins from factories and bacteria-laden water from livestock farms. The fungi mycelia in the sacks capture the poisons and break their toxic molecules into simpler forms that can be metabolized by plants and other organisms. According to Stamets, oyster mushrooms, for example, are very good at breaking down hydrocarbon molecules into carbohydrates and water. One obvious application would be oil-spill cleanups. Kevin wonders whether a variation of Stamets’ bunker spawn concept could be used to help clean up Mill Creek, the troubled stream that runs through the heart of urban Orangeville and lends its name to the pub where we sat enjoying beer and chaga. Kevin imagines the creek filtering through a permeable barrier filled with an organic matrix – straw, for example, infused with oyster mushroom mycelia – that would intercept and deconstruct the toxins. Though the practical problems associated with such a scheme may be insurmountable, it presents an interesting thought experiment. Who knows? There may be ways to use fungal remediation techniques to augment traditional water treatment methods. As a species, human beings have long used fungi to our benefit, and it is fascinating to ponder that people long ago knew about health benefits only now being rediscovered. More than 5,000 years ago, a man was murdered in the Ötztal Alps of northern Italy. An arrow pierced his shoulder and lodged close to a lung. Soon he was entombed in ice that preserved his body and belongings over millennia. Then, in 1991, he was found by German hikers. His body was chiselled out of the ice that still held him fast, and he was taken north to Innsbruck, Austria, for an autopsy before being repatriated to Italy. He was named “Ötzi” for the mountains where he was discovered. The moniker “Iceman” also stuck for obvious reasons. Ötzi the Iceman’s body and belongings yielded a treasure trove of information about his health, his times and his lifestyle. Two mushrooms, still common today throughout the northern hemisphere, were found in a pouch tied to his clothing. One was tinder polypore (Fomes fomentarius), a hard, woody fungus shaped somewhat like a horse’s hoof. 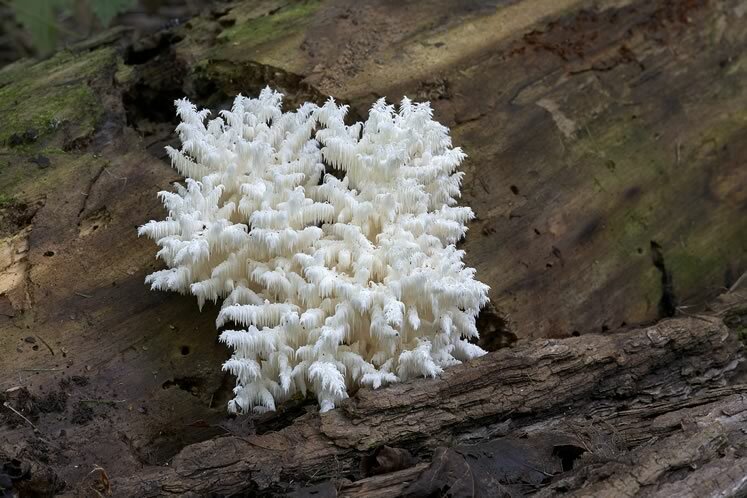 I’ve found this fungus many times on my Bruce Trail rambles. Tinder polypore, as befits its name, is apparently an excellent fire starter, easily ignited by sparks. And it smoulders a long time. So Ötzi was well equipped to start campfires on his mountain journey. The other fungus he carried was the birch polypore (Fomitopsis betulina). Modern research has found a compound in this fungus that is toxic to intestinal parasites. Ötzi’s autopsy revealed his intestines were plagued by parasitic whipworms, so it’s reasonable to speculate he was using the birch polypore as medicine. While I was discussing this with Kevin, another container appeared, this one filled with chunks of birch polypore gathered in Headwaters. Enthusing about its antiparasitic properties, he said, “You make a tea from it.” If whipworm ever takes up residence in my gut, I’ll be prepared. As for Ötzi, it seems that 5,000 years ago he was on to something. Fungi are now gaining serious attention in medical science. Mushrooms, and the cornucopia of exotic compounds they contain, are being studied for their potential in treating a vast range of health problems and as substitutes for antibiotics whose effectiveness is increasingly compromised by drug-resistant bacteria. Stamets is a huge proponent of fungi-derived medicine. In his TED Talk, he states with conviction that one way mushrooms can save the world is to enlist them in the fight against viruses. He cited his own research that found various mushrooms, including the chaga I was drinking at the Mill Creek Pub, showed extraordinary promise in combatting flu viruses. In his book Mycelium Running: How Mushrooms Can Help Save the World, he presents many other claims asserting fungi can help defeat other viruses, harmful bacteria and even cancers. As Kevin and I parted, I pondered the task that lay ahead. My knowledge of fungi had – well, mushroomed. But I needed to distil all that information to a more manageable size for this article. So I’ve written nothing of the purported link between Santa’s flying reindeer and fly agaric mushrooms, or the speculation, admittedly far out, that mushrooms are extraterrestrial in origin. I also decided to leave out some novel uses of fungal mycelia that include the manufacture of clothing and furniture. 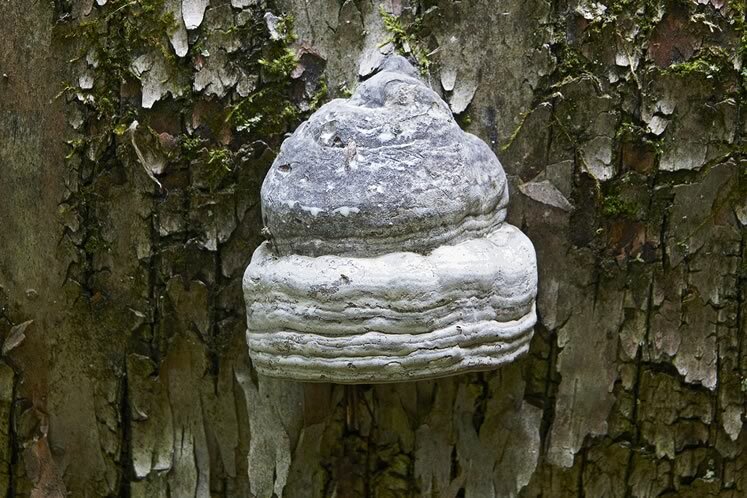 Chaga mushrooms (Inonotus obliquus) grow on birch trees. 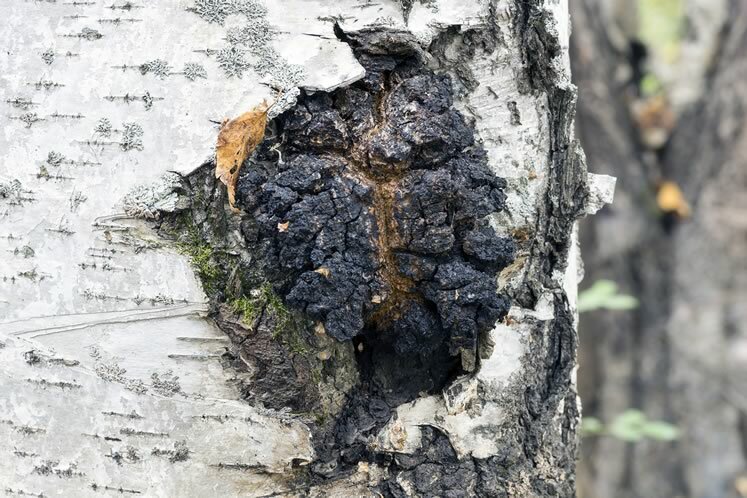 Though unappealing, chaga makes for a mild ­ tasting but powerful antioxidant tea. Photo by Aleksei Marinchenko / Stock. Fungi have fascinating tales to tell. They work largely out of sight, sometimes exacting a terrible toll on other living things. But as we are learning, they also support ecosystems through their remarkable mycelium networks. And as Stamets avows, fungi may have the potential to help us solve some of the most challenging problems of our time. On September 22, mushroom expert Bob Bowles leads a walk and talk through the Wallwin Tract of Simcoe County Forest beginning at 10 a.m. 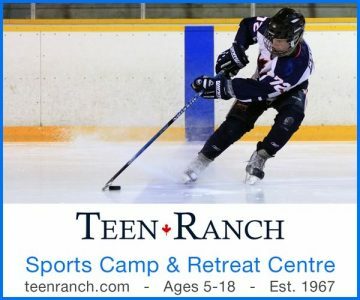 Hosted by Dufferin Simcoe Land Stewardship Network, tickets are $15; register at dslsn.org. And on September 25, Kevin McAuslan presents a talk on fungi biology and cultivation. 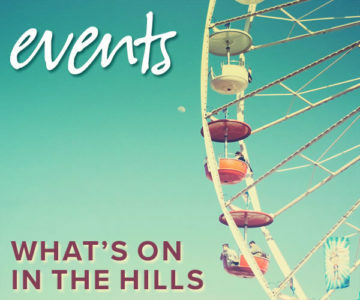 Hosted by Upper Credit Field Naturalists, this free event is at 7:30 p.m. at Orangeville Seniors’ Centre, 26 Bythia Street. George Barron’s Lone Pine field guide is an excellent resource for identifying many of the mushrooms found in Headwaters and the rest of Eastern Canada. Eugenia Bone’s volume is an enjoyable read packed with personal, often humorous stories. Not in a hurry? Growing your own mushrooms might be for you.